silently and without any end user interuption from your remote hosts under full administrator rights. opened again into the built-in program internal viewer. 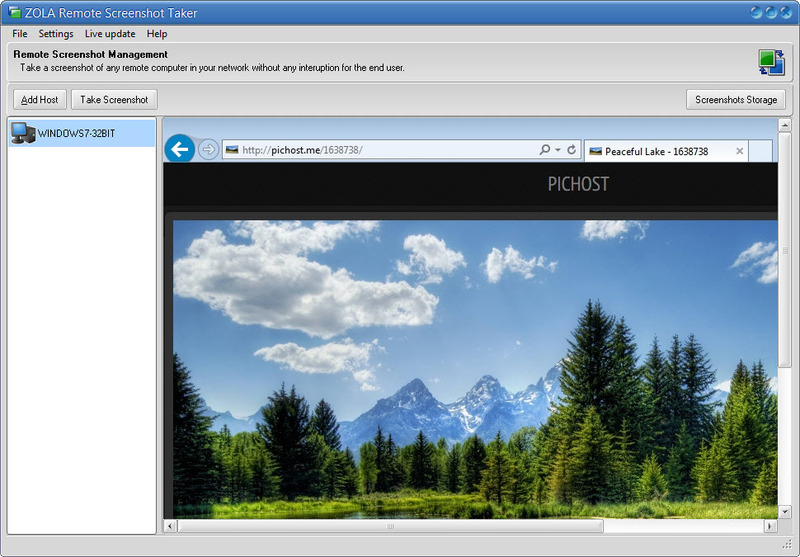 a remote screenshot from any host remotely without any end user interuption. been saved automatically to your stored location. The location can be changed under program settings and can point either to a local or a shared paths using UNC names. tra fast and reliable. The snapshot module also captures all screenshots in a thread. hosts can easily be opened into program internal viewer. For each host settings you can configure the jpeg quality from 0 to 100%. product uses a secure socket running over a TCP/IP. enterprise network and only works under full administrator rights. Capture remote screenshots in enterprise networks from any remote computer running Windows operating system. Screenshot module uses a secure TCP/IP connections to capture all screenshots in a silent mode operation. No limitations when adding remote hosts to the program host list. Multi monitor support to capture screenshot of all active monitors connected to remote computer. Save all captured remote screenshots into local or remote UNC path storage.